Every health-conscious Las Vegas parent knows that sugar is the number one cause of cavities for Nevada kids – and plenty of us adults also snack on too many sweet snacks and beverages. Because of cavity risks, low nutritional value, and high calorie content, many Las Vegas parents want to limit the sugar in their children’s diets. Obviously, there is a lot of sugar in bubble gum, lollipops, and gummy candy. But there is also sugar lurking in so-called ‘healthy’ snacks. 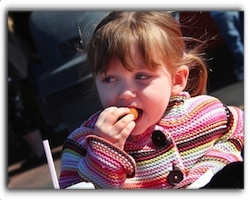 Controlling sugar intake in your Las Vegas child’s diet is essential for lifelong oral health. When choosing lunchbox or after-school snacks at your Providence market, Las Vegas convenience store or recreation center snack bar, read the labels. Sugar content varies among brands. Sugar is only one diet component that impacts Las Vegas kids’ oral health. If your son’s or daughter’s diet is lacking key vitamins and minerals, the tissues in their mouth may have trouble fighting infection. These infections can lead to gum disease. At Providence Dental in Las Vegas, we provide high-quality children’s, general, and cosmetic dentistry to patients in the Nevada communities of Las Vegas, Providence, and NW Las Vegas. The team at Providence Dental pampers our youngest patients. If you have a toddler who has not visited a dentist, call us today to schedule a first-time dental check-up. Our number is 702-852-2244.